One of the coolest threads on TBH, I don't shoot traditional but man this makes me want to learn. In for the next round of sign ups...by the time it comes around maybe I'll have my own. ***WARNING*** This Trad game is very addicting! but a lot of fun. Look what the mail man dropped off. The wife called me at work asking what did I order now lol. Going to try and shoot this weekend if the rain holds out. Last edited by DCT; 08-03-2018 at 01:29 AM. Glad to see you got here in your hands DCT!!! I look forward to hearing more from you! She is on her way to DRT. Due to work I didn’t get to shoot her much. As soon as I get some time I’ll get a write put together. Well she's here. In good shape and already on the backyard range. Let's just say I'm surprised by how well, how quiet and how smooth she shoots even with these too stiff arrows. I'll post some more later. Now I'm going to fletch some 600s to see if I can get them to fly better out of her than my 500s for my TT. A quiver full st 12 looked okay so I moved to 15. That wasn't too bad so I tried a couple of groups at 20 . . . That faded 1" dot isn't easy at that range with my recurve but I was glad to see I could shoot her even with over spined arrows. Then a couple of quivers st the pig target while grilling dinner. My name is Gerald, aka Gary, Cook and I'm an arch-a-holic. I have been in Texas since the mid 80's and have been married to my wife for 32 years, have two kids of our own and one we adopted through scouting. My first archery experience was when I was in grade school. Growing up in a small hamlet in the Adirondack mountains I had plenty of daily immersion in the outdoors. At a young age I was popping red pine squirrels and chipmunks with a Daisy BB gun and terrorizing all the starlings and cowbirds I could get close enough to. Fishing, trapping and hunting were the basis of life for me from my first memories until the day I left for boot camp. Archery was not something I was well versed in at an early age. John Hulburt (sp? ), a neighbor up the road, had three kids and was a forest ranger. One day he had his girls, one of whom was my age, out shooting some of the typical fiberglass youth bows and when I wandered by he invited me to participate. Soon I was there on a regular basis shooting with his family. I knew them well as most Sundays they stopped on the way by and took me to Sunday school with them at the Oswegatchie baptist church and I owe them a debt I can never repay just for that. Unfortunately the archery thing was a passing fancy as we were poor and I couldn't afford my own bow so other than his hay bale and one unlucky pine squirrel that was right there by his house I never really got to do much with the new interest. Fast forward to the late 80's and I acquired an old Bear bow from one of my wife's relatives and proceeded to shoot in my yard. I never had any formal instruction, although at some point my friend Ronnie came over to shoot and gave me some pointers, but I got good enough to pass the test on a day lease where you were required to put 5 of 6 arrows on a paper plate. 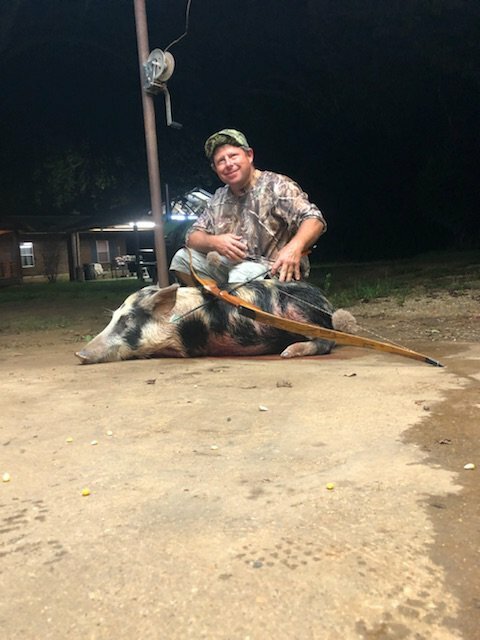 However, except for one armadillo in eat Texas no critters fell to my hunting with that bow. While at the Lake Worth K Mart I picked up a Bear Whitetail 2 compound and even though I shot it bare bow with fingers for a while my stint with a "traditional" bow ended for a long time. That year I got on an archery only lease in Llano county and killed my first 5 archery deer, the first shooting fingers as I had dropped my release somewhere on the way to stand, and I was hooked. However on that same lease there were a couple of fellas who were "traditional" archers and belittled those of us using training wheels. Funny thing was that between the two of them they shot at least 10 deer that year and only recovered one each that I knew of. Wounding to them was no big deal because "there ate too many deer in this area anyhow". I knew a couple of trad guys at Cowtown bowmen who were really good but they freely said they have to shoot a lot to maintain good form and I knew I didn't have the time to commit to traditional archery with a family and working two jobs so it got left by the wayside as a someday for me. I shot my compounds once or twice a week for much of the year, more approaching hunting season and was hooked on archery. Soon I was shooting deer with a bow on day leases, good leases and some bad leases. What really helped me was knowing a couple of guys who had properties with MLD permits that I could go and shoot several deer in a weekend (doe and spikes). In the last ten years I've shot maybe 5 deer with a rifle but most of those were after a surgery when I couldn't shoot a bow. Fast forward to 2016 and I started to get more and more interested in going to traditional equipment. 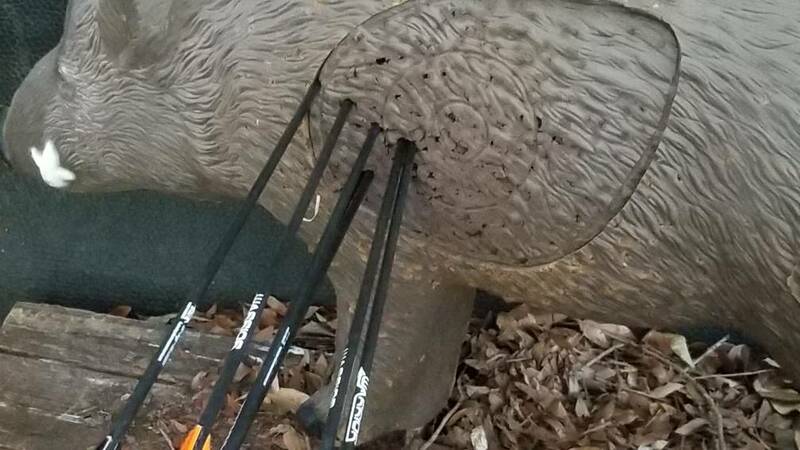 In all honesty the compounds I've owned the last few years are killing machines and I could go out in my back yard to practice at 50 yards and comfortably keep the arrows in under a 6" group without much regular practice. Don't get me wrong, I still killed my animals under 30 yards, but I started to yearn for that challenge I didn't understand. Retirement from my city job gave me the time, and mental relaxation, to start exploring that need. I have on old Bear bow and I took it to my local archery shop and got some arrows. I proceeded to shoot and realize I sucked. I couldn't hit the bag target consistently and even though guys here gave me well intended advice I couldn't apply it because I didn't understand some things. 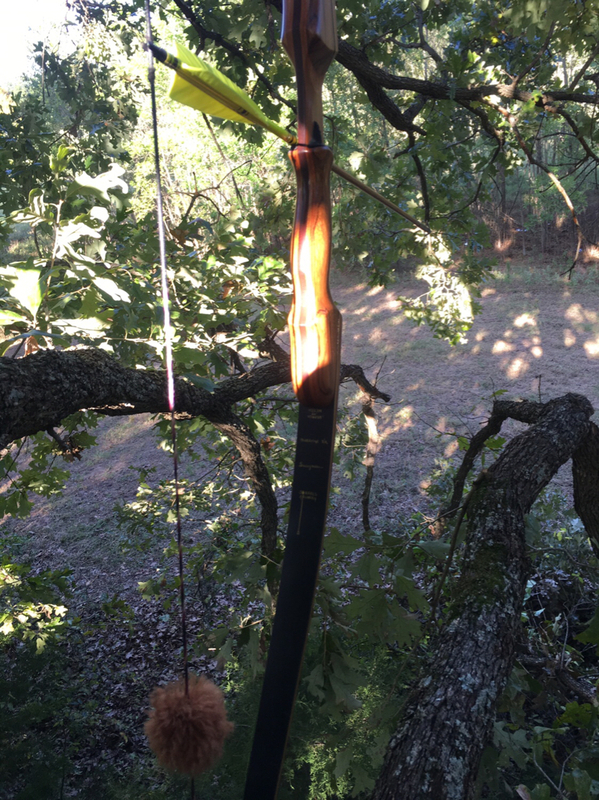 I got frustrated and was just about to give up trying when I went to Big Oak and hunted with Ryan (CRM95) on the first weekend of archery season in 2016. Ryan had his longbow, Buff had his Widow and I had a brand new Hoyt Carbon Spyder. Excellent weekend of hunting as always there (Ryan got his first trad big game animal) but more importantly I got some great advice from Marty that encouraged me enough to try again and find what could work for me. I bought a Samick Sage and proceeded to make mistakes, learn that a compound bow set up was not necessarily gonna work for a trad bow even if it was a close shot, and how bad it hurts to wound an animal because I wasn't quite ready to hunt even though I wanted to be. Then, in the last week of the extended season I did take a doe on our new property near Hawley and even though it was 17 degrees outside the fire was burning hot in me with this new trad addiction. Since then I've taken a couple more deer, although a broken finger side tracked me last season a bit, I've kept shooting and bloodied some pigs as well. Most importantly shooting a bow has again become the highlight of my day. Before I head out to work on a boat lift or while grilling dinner I shoot. After dark with a flashlight shining on the target or mid day when I come home from lunch I shoot. Putting together arrows, working up different arrows and playing with all the spine, length, point weight combinations has turned into satisfying time spent. I have a Black Widow PSA that I don't shoot much anymore because most of my shooting is with my Tall tines recurve that I'm a more accurate with for some reason and is a few pounds heavier in draw weight. I currently and waiting on a bow from Randy and am looking forward to a longbow I can shoot well to have in my arsenal. It will allow me to shoot in a second class at TBOT events and that is something I'm looking forward to for next season. The three I shot at this year were fun and the people that shoot them are a lot different in attitude then what I had experienced in the compound 3D shoots. 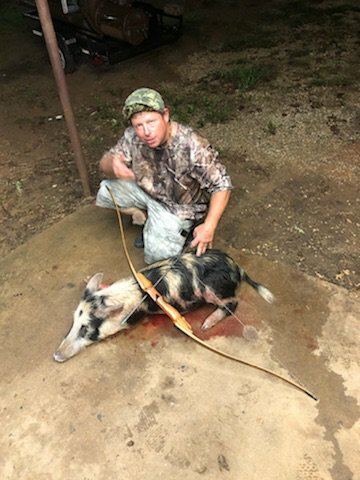 I'm extremely grateful to the guys on this forum for the information they provide, and putting up with me as I know I can be aggravating at times, because without you I couldn't confidently grab a strange bow like Sacajawea and shoot it like this. Well. When we takin her hog huntin? I don't reckon you'll be throwin her in the bed of the truck like we usually do huh? Good write up Gary!! And good luck with Sacajawea!! Nope. You'll have to ride in the back so she can ride shotgun! No kiddin! I don't even want to touch her. Wife says I can tear up a steel ball, that's why I've never got on the list. You should get on the new list Ronnie! It’s pretty cool playing with her and becoming part of the story!!! I know it Bisch, but seriously, with my luck a meteor would fall and land on it. Well I spent the weekend drinking too much Modelo, not shooting enough birds and working on chopping out cactus and putting up a feeder pen. Tonight I'm putting together some arrows for her and get back to shooting her tomorrow. I think I found a set up that will work for me. Still tweaking the brace height. Shooting 500 spine GT Warriors. Full length (30.5") with a standard insert and GT nock. 150 grains up front gives me about 9.2gpp. This is a group at 17.5 yards. That’s 3 dead pigs right there!!!!! I'd take one. Time to find a place to draw some blood with her. Headed to Fairfield tomorrow afternoon. Going to spend some time with a good friend, eat some good seafood and hopefully bloody an arrow. Bad time of year I know but I gotta try. Well the rain and cooler temps had the pigs moving but the 20 sheep/goats at the feeder made getting a clear shot tough. I finally got an 80lb boar clear walking between two goats and let fly with a pile driver. He ran about 75 yards but ended up 50 yards from the feeder. A pass through quartering slightly to me at 12 yards or so. Way to get ‘er done, Gary!!! Congrats on the pig DRT! She is on her way to Spidermonkey. I enjoyed shooting her but the last few days she has set on the rack because I've been shooting my bow in prep for the season. Hopefully Rusty will have an opportunity to take a deer with her as his fortune is to have her during archery season. I appreciate the opportunity to be on the list and participate in her journeys. She shoots easy. Good right up. Good hunting this season. Good writeup Rusty. Wishing you success with Sac. I feel like I know you better now, Rusty! Good write up, and good luck! 8Great write up Rusty!! Good luck with Sac!! Great writeup Rusty... and yeah, I know what bow you are talkin about. In fact, I am hoping to get some arrows tuned up real soon. How did I get skipped? I've been waiting a while. Good luck with her, hope she does you right. That was totally a mistake on my part, and I’m very sorry! You will be next after Rusty. PM sent with explanation and apology! Last edited by Bisch; 10-01-2018 at 08:05 AM. bowtecmike, did you see my PM???? I got it, no worries. I'm good with whenever. Good! Rusty will send to you, and you will send to StoneColdBobby!!! Good write up Rusty. I hope you get a chance to stick one with ol Sac pretty soon! Just got a text from Rusty...today it’s Sacajawea’s turn and they’re in the tree as we speak. Hope they get it done this evening!! It’s dark now! I hope y’all got to play!!! !